It goes without a doubt to say that celebrities and figures from higher societies choose to don a status-symbol look, and that is reflected mostly in their choice of style and attire. These stars yearn for attention from the public eye and will go through all possible measures to get to the highlights. And this could not be truer than on their special, big day, where celebrities take the craziness to an entirely new level, with wacky, bizarre, or simply unconventional choices for the wedding gowns they choose to don. Amongst the number of celebrities wearing different dresses on the big day, are those who opt for an even stranger signature style on their wedding: a dress in any shade other than white. So, for the daring bride, hesitate not: Don’t want a white dress? – There are other options. The list of celebrities covered in this article opts for a more exotic branch of attire, sure to bring the public’s attention, stirring the right amount of controversy and a hint of sheer awe. Whenever news reaches the public about a major celebrity or high-end couple at the very forefront of the media tying the knot, the first thing most of us want to know is what the wedding dress looked like, if there were any major style fails, and how well coordinated the overall look was. When Kate Middleton, the now Duchess of Cambridge, and Prince William were tying the knot, around 2 billion people worldwide gathered to watch the whole ordeal. Middleton donned a hand-cut, A-line silhouette gown with a delicate V-neckline, made from a mixture of English lace and French Chantilly, designed by the royal family’s good friend and designer Sarah Burton, along with a stunning pair of bridal Alexander McQueen heels. Middleton’s is surely one to remember for all the right reasons. 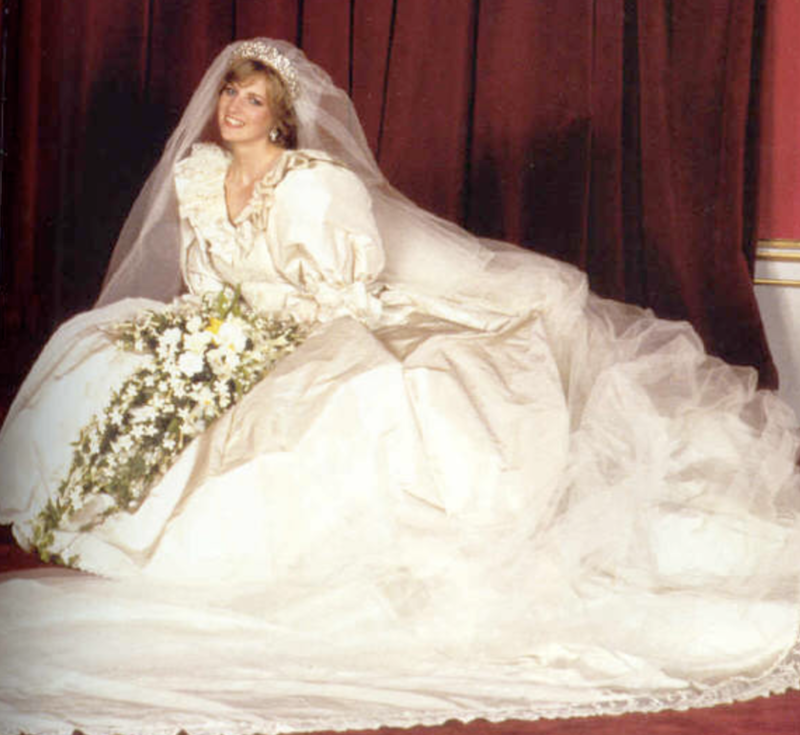 Lady Diana’s wedding gown for her wedding to Prince Charles, was a far cry from the sophisticated and classy style she later developed. Diana’s silk taffeta dress was composed of over-the-top puffed sleeves, combined with a ruffled skirt, intricately and entirely decorated with a mixture of lace, sequins, embroidery, and a pain-staking 10,000 miniature pearls. This royal wedding was one set to be remembered for many years to come. Everything about Tina Turner’s marriage to Erwin Bach screams anything but conventional. Getting married (again) at age 73, the pop singer chose a daring, dazzling, almost electric shade of lime green. Another one to top the list has to be the Baywatch star Pamela Anderson who decided that less is best and opted for a tiny, revealing white bikini for her marriage to Kid Rock on the sunny Saint Tropez. Angelina Jolie’s dress for her wedding to star heartthrob Brad Pitt was anything but ordinary, if not absolutely heart-melting. The A-line silhouette Versace gown which Jolie donned for her special day was studded with intricately hand-sewn drawings of her clan of six children.